John of Trevisa (1326-1402) was Vicar of Berkeley, Gloucester, and chaplain to Thomas, 10th Lord Berkeley. Having been expelled from his post at Exeter College, Oxford, Trevisa continued his career as a clergyman and scholar under Lord Berkeley's patronage. 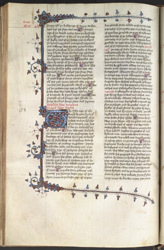 This manuscript presents his English translations of three Latin texts, one of which is incomplete. A translator rather than an original author and not a great scholar, he is credited mainly with providing important examples of early English prose which were used by later writers such as Shakespeare. Ralph (Ranulph) Higden, a monk at Chester, wrote his 'Polychronicon', a best-seller world history, in Latin sometime around 1327 and updated it in 1342. Afterward other writers added entries. Trevisa wrote the first English translation of it in 1387. The book was so popular because it was the only exhaustive history available. Despite the up-to-the minute content of the 'Polychronicon', the Bible was still considered in the later Middle Ages the main historical source for the pre-Roman world. This page presents the beginning of 'Section 3' of the 'Polychronicon', which covers the history of the Jews in Egypt, the exodus and the biblical prophets. The deluxe presentation of the text with wide margins and beautifully painted decorated borders reflects the status of the owner for whom it was made, Richard Beauchamp, Earl of Warwick, a model knight and author.